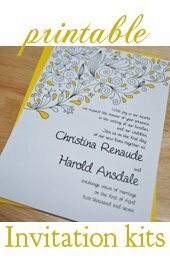 Making wedding invitations that are affordable and beautiful is a lot easier than you might think! 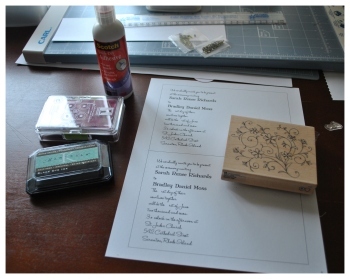 One of my absolute favorite ways to create fabulous DIY wedding invitations is by using a rubber stamp. The genius part of it is, you can use the same stamp over and over again throughout your entire wedding stationery suite and other items. This gives your wedding a really nice, well put together, branded feel. And all of it can be pulled of on the cheap! Visit your local craft store with a friend or two, and coupon print outs from the internet. You can find your stamps, ink, and more, all while saving a fortune if you each purchase an item with a coupon! Step One: Start by printing out the wording for your invitations. Here I am making a 5" by 7" invitation. 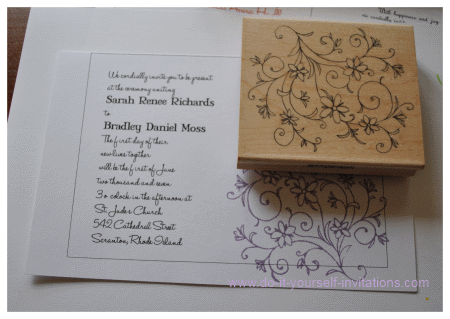 I used one of the free printable wedding invitation templates I offer here on the website, to print two invitations per page. I used the landscape template to print the wording for my invitations onto some heavy white 110 lb. cardstock. Using a personal paper cutter, slice the paper in half separating the two invitations from the page. If you are printing onto pre-sized paper do the rest of the steps using some scrap paper under your project. Step Two: Apply the rubber stamp image. Depending on what stamp you choose to use, what type of stamp, and it's size, you may work through this part differently. The stamp I am working with is on the larger size, but it did not stand alone well. So I applied it to the paper by slightly overlapping the edge where the paper is meant to be cut. I apply the image first to the bottom right hand corner, and then flip the image in reverse form the bottom and stamp it again in the upper right hand corner, again, overlapping the edge. because of the swirly pattern it blends quite well together to appear as one solid pattern or graphic. 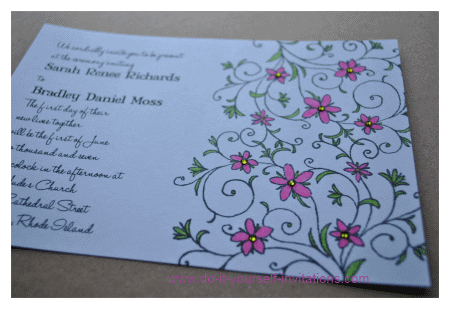 I created these invitations by simply stamping the design in black ink and then coloring in the petals and leaves with pink and green ink. I used a simple set of markers. They were actually a set of Martha Stewart art markers I bought on sale. They work great for these kind of projects! After adding some color I also added some yellow rhinestones to the center of the flowers. I attached the rhinestones using Scotch brand fast drying adhesive. I left a small blob of glue on some scrap paper and then dipped the rhinestones using a set of tweezers. The adhesive dries clear and goes on light so it is great for small projects. The end result is absolutely stunning! 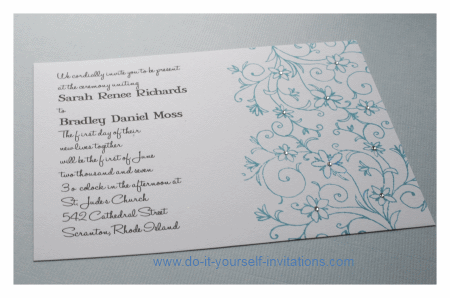 You could use the same methods throughout to create RSVP's, STD's, and any other invitation inserts or pieces you might need. You could even create envelope liners with the stamp as well. As far as homemade wedding invitation ideas go, this Invite is simple as can be. I stamped the flowery flourish design using some pink ink (It was "ballerina pink" chalk ink by Inkadinkado) and then added some pink rhinestones to the flower centers. Simple but Oh so pretty. 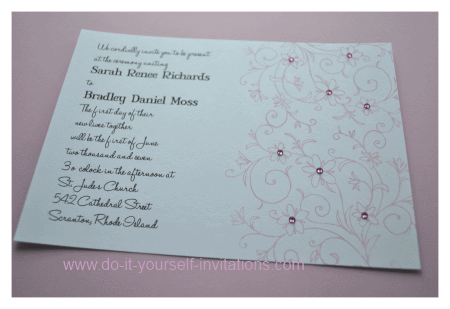 These would work out well "as is" using maybe a nice satin pink ribbon to hold together the invite and RSVP, etc.. But I think they would also make absolutely beautiful pocketfold invitations, or even simply layer some cardstock and decorative paper together and top with a ribbon! So, OK I know that flowers and winter don't always go together, but here I think it works. Even better if you paired this with a cardstock that had an "icy" metallic sheen to it. I stamped the floral flourish using some blue chalk ink, and topped the image off with bright white rhinestones added to the flower centers. So beautiful! Add these to a pocketfold, or pair with some cardstock. * To save money always search online for printable coupons or online shopping coupon codes. You'll save a bundle! * A good rule of thumb is to keep a marker handy that is the same color as the ink you are stamping with. That way if there are inconsistencies in the ink, you can correct them by hand.